So yeah, I was shocked like the rest of the world when the news of Michael Jackson's death came out yesterday. I'll always remember I was loading my stuff onto the belt at Costco with Caroline and overheard the cashier and his helper talking about how sad it was that Farrah Fawcett died and now how crazy it was that Michael Jackson had died. WHAT? Definitely didn't see that one coming. And then of course the whole "celebrities die in 3's" thing with the combined death of Ed McMahon. Anyway, I turned my satellite radio over to the 80's channel and sure enough, there was Man in the Mirror playing. At all the lights on the way home, I was checking my Blackberry for news on CNN.com and found how slow the site was which I found out later was pretty much the same for everyone. The internet practically busted yesterday with this news. Which in itself is a pretty interesting phenomenon! So I got home and broke the news to Jason (he had only heard that MJ had been taking to the hospital) and then came in on the PC and played some MJ tunes for the kids. Piper seemed to like "Rock with You" and danced around a bit with Bryce and me. I was not surprised to see everyone's Facebook statuses reflecting his death but I was surprised to see the sadness some people had. And this, I guess, is where there is a pretty big divide. I'm on the side that believes while his death is a shock, it's also not as sad or shocking as it would have been 15 years ago when he was still recording and performing. Plus, after we've seen his strange antics in the past 15 years with dangling his baby over a balcony, keeping his kids covered in veils, and various other odd behaviors. That Martin Bashir interview alone was pretty damning if you even suspected he was a little odd before that. And of course there's the issue of his 3 children. While I feel bad for his kids to have lost a parent and to have their world completely changed, I do wonder if in the long run this might be for the best. Of course, provided they have a stable and loving environment into which they will now live. MJ's odd behavior coupled with how he was constantly flanked by reporters, photographers and fans everywhere he went just tells you what a tough time those kids must have had just being normal kids. Of course, let's hope MJ's parents don't have ANYTHING to do with raising them. Yeah, MJ was a troubled soul and likely mostly from his crazy upbringing but he did give the world some amazing music in his peak. But, I guess when I think of MJ now, THIS is how I think of him. (Don't click that link if you are alone in a dark room!) It just epitomizes the weirdo he was and how different he was as a child. Can you even believe that THIS is the same person???? So I won't be mourning with the rest of the world over his passing. The possibility that he would have had any more hit songs and really resurrected his career is highly unlikely. He's been "done" for about 15 years and honestly, his existence between then and now is probably more sad than his actual death. He went from having unbelievable amounts of money to being ridiculously in debt. And I won't even talk about the alleged child molestation charges - suffice it to say that I wouldn't have ever let MY children get near the guy. Rest in Peace MJ - We'll keep rocking out to your tunes and try to forget about the last 15 years. I feel sorry for him. He was such a troubled and sad person. Clearly he was suffering (in more ways than one) for a VERY long time. To me the bigger story is the legalized drug pushers that live with these celebrities and poison them to death. I don't really care that much about MJ himself. I certainly don't understand the people who went and stood outside of the hospital where he died dancing the moonwalk. More Wackos. MJ was a very odd person. How he got that way is BEYOND me. I don't understand how his parents and family could let him continue that way for his entire life. It's cruel actually. And his kids. First of all, I still can't even believe he has children or that he was ever married to anyone. But the kids--Oh dear. Is there any hope for them??? I hope so, but I am doubtful. One thing is for sure, when I hear "Beat It" I am instantly transported back to the 80's and flooded with memories from my childhood.... (And I wasn't even a fan back then-- his personality was just too odd for me to admit liking his music-- but his music was just played so much that these memories are triggered.) The same goes for Thriller, Bad, Billie Jean, and Man in the Mirror. The nostalgia is what I tune in for with this tragedy. P.S. I thought his crotch-grabbing dancing was just gross. 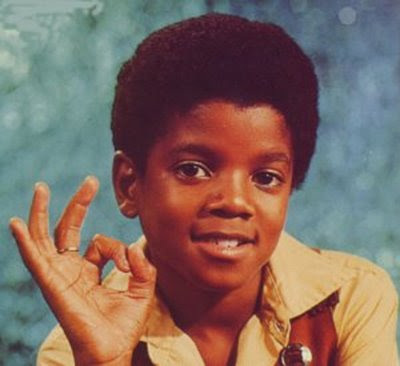 It's no wonder my mom forbade us from liking MJ as kids.